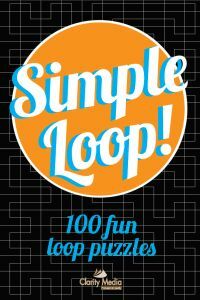 Welcome to this fantastic collection of 100 brand new simple loop puzzles! 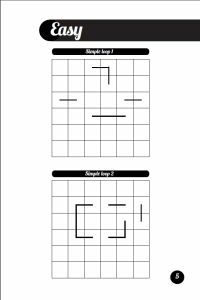 The rules of the puzzle are simple: draw a single, continuous loop that visits every square in the puzzle grid just once. The loop cannot cross itself. This book contains puzzles at three different grid sizes: 6 x 6, 8 x 8 and 10 x 10. The larger puzzles may take a little longer to solve but the rules are the same. There are various tips and tricks that will help you solve these puzzles. Remember that the loop must enter and exit each square, so look for instances where there are only two neighbouring squares that can be visited by an empty square: the loop going through that square can be marked in directly. Also remember that the loop cannot close itself until it passes through every square in the grid, so if taking the loop in a certain direction would cause part of the loop to join itself prematurely or equally would isolate part of the loop then it cannot go in that direction. Good luck with the puzzles, and remember that they each have a single solution for you to discover.. Whether you are solving fences / simple loop puzzles, or other common types of loop puzzles such as slitherlink and yajilin, there are several tips that it is worth considering to help you solve the puzzles. Whilst this guide focuses on simple loop, of course, some of these strategies will also apply to other loop puzzles too. The first tip is to look at the corners: in simple loop, you can fill these in straight away: there is only one entry and exit point for these squares, so you can fill in the path of the loop through them immediately. Also look at the edge squares, as there are a maximum of three options here, so often some of these can be marked straightaway. As a general solving rule, always look for squares where you can mark at least either the entry or exit square straightaway. In the first sample puzzle to the right, you can place both the entry and exit squares for cell five in row one: can you see how? Another tip is to remember that the loop can never close on itself - apart from to complete the puzzle when everything is placed. Otherwise there would be more than one loop in the puzzle, and that is not allowed. So again take a look at puzzle one, and the top right corner. You will place the loop such that the loop goes right in square five and down from square six into the equivalent squares on row two. Now you can use this rule: the loop could close on itself by squares five and six in row two joining together (to form a 2x2 loop): but you know that's forbidden by the rules - therefore you can mark a small 'x' between those two squares on row two so you know that connection is forbidden. Generally looking for instances where the loop would have to close on itself prematurely if it follows a certain direction is a useful rule when solving loop puzzles, including fences / simple loop puzzles. One more useful strategy tip for loop puzzles is to remember that you can't have an odd number of loop ends going into a closed section of the grid (where they must all connect up) - because doing so would lead to one section of the loop being isolated (clearly ends must join up in pairs - therefore an odd number would lead a loop section that couldn't join up, breaking the puzzle). Finally, from time to time you might find it useful to use 'if / then' logic, and look a step or two ahead: eg if the loop moves into this cell, will it cause any problems, or will the puzzle still be solvable? Only use this sort of logic if you can't find any other way to make progress. It will be required with some puzzles in this book (though all have a unique solution) but always at a manageable level only, you will only ever need to look a little bit ahead on up to a few occasions to solve these puzzles. We hope you find these tips useful - if you have any comments or ideas please do just let us know.